We’d love your help. Let us know what’s wrong with this preview of Pense Como Um Freak by Steven D. Levitt. Now, with Think Like a Freak, Steven D. Levitt and Stephen J. Dubner have written their most revolutionary book yet. With their trademark blend of captivating sto The New York Times bestselling Freakonomics changed the way we see the world, exposing the hidden side of just about everything. Then came SuperFreakonomics, a documentary film, an award-winning podcast, and more. 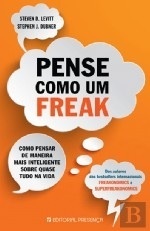 To ask other readers questions about Pense Como Um Freak, please sign up. Pretty great for non-podcast listeners, but as someone who loves the Freakonomics podcast, most of this material has already been featured on there, and some of it in greater detail. A very ordinary effort. Levitt & Dubner tells us the recipe to “Think Like a Freak”. Most of the ingredients are quite ordinary and almost all are trodden territory. A wholly unnecessary book. 1. That all the Big Problems of the world are too tough to solve for ordinary people like us and that we should nibble at the edges. - A bit about game theory and about how most problems arise due to private vs public conflicts and how we need learn to realign incentives to solve small problems. Keep nudging the incentives and solving small incentive-problems. The very soul of Freakonomics. 2. That we should learn - to say “I don’t know” more often, especially the experts. A few stories thrown in about how stupid people who try to predict the future are. - Also, don’t bring your moral compass into your predictions/decisions. And always look for feedback if you want to keep improving. 3. That we have to learn - to ask the Right Question. Reframe the question to get ahead. - Endlessly experiment to get the right feedback on the reframed problem. The ‘abortion & crime’ story is repeated. AGAIN! 4. That we should - Think like a Child: Have fun. Don’t ignore the obvious. Think small. 5. That we should obsess over - Incentives, Again: Understand contexts; Reframe contexts. Use appropriate incentives. NEVER mix your incentives! 6. That we can win arguments: How to win an Argument: Don’t pretend your argument is perfect. Acknowledge their viewpoint and... meh. 7. That we might want to think of - When to Quit: Avoid the sunk cost fallacy. BTW, this chapter is for us too — We (Levitt & Dubner) just might quit writing this stuff! In short, nothing really exciting, nothing novel. Nothing that fires the imagination. I am not at all freaked out by the ideas & stories presented here. They can still spin a good yarn, but that gets old fast without the essential ingredient - radical ideas. If indeed the freakish duo decides to call it quits, it would be a pity that this was added to their otherwise magnificent legacy. Incentives are the cornerstone of modern life. And understanding them—or, often, deciphering them—is the key to understanding a problem, and how it might be solved. Knowing what to measure, and how to measure it, can make a complicated world less so. There is nothing like the sheer power of numbers to scrub away layers of confusion and contradiction, especially with emotional, hot-button topics. Our thinking is inspired by what is known as the economic approach. That doesn’t mean focusing on “the economy”—far from it. The economic approach is both broader and simpler than that. It relies on data, rather than hunch or ideology, to understand how the world works, to learn how incentives succeed (or fail), how resources get allocated, and what sort of obstacles prevent people from getting those resources, whether they are concrete (like food and transportation) or more aspirational (like education and love). One reason is that it’s easy to let your biases—political, intellectual, or otherwise—color your view of the world. A growing body of research suggests that even the smartest people tend to seek out evidence that confirms what they already think, rather than new information that would give them a more robust view of reality. The next time you run into a question that you can only pretend to answer, go ahead and say “I don’t know”—and then follow up, certainly, with “but maybe I can find out.” And work as hard as you can to do that. You may be surprised by how receptive people are to your confession, especially when you come through with the real answer a day or a week later. But even if this goes poorly—if your boss sneers at your ignorance or you can’t figure out the answer no matter how hard you try—there is another, more strategic benefit to occasionally saying “I don’t know.” Let’s say you’ve already done that on a few occasions. The next time you’re in a real jam, facing an important question that you just can’t answer, go ahead and make up something—and everyone will believe you, because you’re the guy who all those other times was crazy enough to admit you didn’t know the answer. Levitt and Dubner’s earlier two books, Freakonomics and Superfreakonomics were smashing successes because they came up with innovative insights to make sense of phenomena that were rather mysterious, such as an explanation for the drop in the crime rate over the last decade. Hoping to find similar out-of-the-box proposals, I was eager to try their third book, Think Like A Freak. This book contains a few surprises, but overall it seems like a slap-dash production intended to cash in on the succes Levitt and Dubner’s earlier two books, Freakonomics and Superfreakonomics were smashing successes because they came up with innovative insights to make sense of phenomena that were rather mysterious, such as an explanation for the drop in the crime rate over the last decade. This book contains a few surprises, but overall it seems like a slap-dash production intended to cash in on the success of their previous enterprises. As such, it is somewhat duller reading. There are a few interesting analyses, like about the rationale for the popular email extortion scam based in Nigeria, or how a love of "fun" might be harnessed to encourage people to save more money. For the most part, however, the chapters read like filler material. They include platitudinous management suggestions that make common sense but not compelling reading, such as in the chapter on “How to Persuade People Who Don’t Want to Be Persuaded," and “revelations” about phenomena ranging from the etiology of ulcers to the causes of obesity that made the rounds of popular magazines years ago. Using the examples of King Solomon and rock singer David Lee Roth to provide examples of game theory may have been cute, but it felt like the authors were reaching for the lowest common denominator. In fact, it seemed more like a chapter on the meta subject of How to Expand Your Potential Reading Audience. The last chapter of the book discusses when it is advisable to quit whatever is it you have been doing for too long. Maybe the authors should take their own advice and call it a day. Evaluation: This book is mildly entertaining, but not up the standards set in the first two. Gone are the "economics" of the earlier books; more challenging content has been replaced with bromidic bullet points and stories I read a long time ago in doctor's waiting room periodicals. If I changed the title to “Think Outside the Box” you’d probably have a good idea of what to expect from this book - and you’d be right! Granted I’ve not read Stephen J. Dubner and Steven D. Levitt’s other “Freak” books, Freakonomics and SuperFreakonomics, but I suspect they’re just more of what’s contained in Think Like a Freak. Hey, if it ain’t broke, right? Think Like a Freak essentially has one very broad thesis: to approach any difficult situation/problem from an unexpected angle to solve i If I changed the title to “Think Outside the Box” you’d probably have a good idea of what to expect from this book - and you’d be right! Think Like a Freak essentially has one very broad thesis: to approach any difficult situation/problem from an unexpected angle to solve it/excel at it. It’s not a new idea. The writers relate stories to illustrate this, which I’m sure more than a few people have already heard. How David Lee Roth, the lead singer of Van Halen, ensured the venues they played at adhered to their lengthy stage setup by putting a clause in their rider for no brown M&M’s - if there were none when they got there it meant the promoter had read everything carefully; if there were it meant the crew needed to do a thorough check of the equipment to make sure nobody would be hurt at the show. Or the little Japanese fella who became a Coney Island hot dog eating champion by taking apart the hot dog - separating the bun, dunking it in a glass of water, breaking up the hot dog, and eating everything this way. Before that everyone used to eat them whole, limiting the amount they could competitively eat; now everyone does it the new way. It goes on like this with case after case being brought up of old thinking being usurped by those who came to a situation differently and changed everything. Not that I’m against this attitude in any way but it means Think Like a Freak is quite a shallow read. It has one unremarkable mantra repetitively underlined throughout. Trotting out case studies to prove the benefits of thinking like a freak or outside the box, or whatever, doesn’t make this any more valid or compelling. Sure, there are nuances throughout. They encourage people to think like a child, think about smaller portions of a problem rather than the problem as a whole in order to progress to a solution, saying “I don’t know” is often more useful an answer than saying either yes or no, know when to quit, humans enjoy stories and use them to understand problems so do that whenever trying to explain things (which they apply in this book). But it feels so unsubstantial and obvious - really nothing here stands out as unique or brilliant to recommend readers to pick it up. Think Like a Freak by Steven D. Levitt, Stephen J. Dubner is a book I wish had been around (or I had thought like a freak) thirty years ago. We used to call it 'thinking outside the box ' but I like their phrase much better! Excellent book to try to retrain my brain, not that it is trained now. I think everyone should read this, especially young people. I loved Freakonomics and its sequel, so was expecting more of the same here, but Think Like a Freak is a very different book and suffers by comparison. The thing that absolutely blew everyone away with the earlier books was the absolute string of superb eye-opening stories, taking a sideways look at a problem using statistics and psychology (it wasn’t really economics, but it worked as a title). Perhaps the definitive example was the idea that crime rates had fallen as a result of increased avai I loved Freakonomics and its sequel, so was expecting more of the same here, but Think Like a Freak is a very different book and suffers by comparison. The thing that absolutely blew everyone away with the earlier books was the absolute string of superb eye-opening stories, taking a sideways look at a problem using statistics and psychology (it wasn’t really economics, but it worked as a title). Perhaps the definitive example was the idea that crime rates had fallen as a result of increased availability of abortions some years earlier. In this book, though, the Freakonomics authors set out to teach us their methodology and, by comparison it’s a bit dull. What we get is often ittle more than a collection of management consultancy platitudes like ‘thinking small is powerful’ and ‘it’s good to quit’, because in the end the special thing about the Freakonomics approach was not the basic tools, which are two a penny, but the way the authors employed them. Occasionally we do get a great little story – I particularly love the exploration of how to do better in football penalty shootouts – but there just aren’t enough of them, specifically not enough really surprising, ‘Wow!’ stories like the ones that fill the previous books. The authors really should have taken their own advice when they say the most powerful form of persuasion they know is to use stories. We need more great stories, guys! I loved this book. No, scratch that. I LOVED this book. Authors Steven D. Levitt and Stephen J. Dubner explore how the iconoclastic approach to data revealed in Freakonomics can improve the way we think. As they write, “This book steps out of the shadows and tries to offer some advice that may occasionally be useful, whether you are interested in minor lifehacks or major global reforms.” I have to admit that I became biased in favour of this book when I saw the early reference to Philip Tetlock, I loved this book. No, scratch that. I LOVED this book. Authors Steven D. Levitt and Stephen J. Dubner explore how the iconoclastic approach to data revealed in Freakonomics can improve the way we think. As they write, “This book steps out of the shadows and tries to offer some advice that may occasionally be useful, whether you are interested in minor lifehacks or major global reforms.” I have to admit that I became biased in favour of this book when I saw the early reference to Philip Tetlock, who I have loved ever since his piece, Why Foxes Are Better Forecasters Than Hedgehogs (with apologies to the Publisher of this fine newspaper, of course…) But I will try to write an open-minded review. The authors realize that the decision cannot be made based on statistics alone as the rational side of the brain is forced to contend with the emotional side. This is not, of course, new information. Back in about 370 BC, Plato was writing about the tug between the intellect and the heart. More recently, Jonathan Haidt wrote about the struggle between the rider (the rational brain) and the elephant (the emotional brain) in The Happiness Hypothesis. What makes Think Like a Freak so good is that the authors breathe life into this oft-explored slice of neuroscience through the art of storytelling, like the example about the soccer game. True, kicking a ball dead centre towards the goalie is statistically more likely to result in a goal. But if the goalie does manage to stop the ball kicked right to him, the kicker looks like a bit of an idiot (“Why’d you kick it righ’ to ‘im?” the hooligans in the stands will shout.) As the authors write, “Aiming towards the centre has a better chance of success, but aiming towards the corner is less risky to his own reputation.” And, as they go on to describe, humans (and, in our experience, animals) are rather more interested in “protecting our own reputation rather than promoting the collective good” in spite of claiming otherwise. Therefore, most goalies take the riskier corner kick that is less likely to be successful but has the tried-my-very-best optics for the crowd. In order to think like a Freak, the authors say that we need to be aware of, and overcome, some of the general biases that mess with our ability to think well. None of these ideas are original (I discuss a number of these issues in my soon-to-be-released book, Engage the Fox) but the authors’ gift resides in their ability to tell a memorable story. Instead of boring the reader silly with talk of confirmation biases and herd mentality and the gap between revealed and declared preferences, they walk us through memorable examples such as how the Smile Train charity raises funds by not asking for money, why Zappos offers new employees $2000 to quit, and why rocker David Lee Roth insists on a candy bowl containing no brown M&Ms. One of the most powerful sections in the book covers the art of persuading someone to change his or her mind. The authors are not optimistic: “As hard as it is to think creatively about problems and come up with solutions…it is even harder to persuade people who do not wish to be persuaded.” They dissect a $1 billion anti-drug campaign that not only did not turn people off drugs, but possibly made drug use appear more appealing. They then outline the most useful strategies for getting others to change their opinions (hint: don’t start campaigning with the so-called smartest guys in the room, but not for the reason you think.) In keeping with their Freak perspective, they show how pointing out the flaws in your own arguments is one of the most effective ways to convince people you are right. I got the audio version from the library and was delighted to find that Steven Dubner, famous for his Freakonomics Radio, was the narrator. In typical whimsical style, they extended their previous ideas into the realm of practical suggestions. While they aren't covering Friedman style weighty economic issues, this book is excellent for what it purports to be - a light-hearted treatment of thinking differently. While it isn't profound or weighty, it is just as useful for all that. In fact the acc I got the audio version from the library and was delighted to find that Steven Dubner, famous for his Freakonomics Radio, was the narrator. In typical whimsical style, they extended their previous ideas into the realm of practical suggestions. While they aren't covering Friedman style weighty economic issues, this book is excellent for what it purports to be - a light-hearted treatment of thinking differently. While it isn't profound or weighty, it is just as useful for all that. In fact the accessibility and whimsy in the book are part of its charm and what makes it effective. This book does nothing to cure my sickness: footnote-itis. Behind the two-hundred pages of text are another couple of hundred benign-sounding “underlying research citations and other background information", which the authors encourage me to use. Thanks Mr. Levitt. Thanks Mr. Dubner. I needed an extra day to write this review because I spent most of one night watching lectures from Yale Professor Dan Kahan talking about the Cultural Cognition Project. Only one-hundred-ninety-nine more footnotes This book does nothing to cure my sickness: footnote-itis. Behind the two-hundred pages of text are another couple of hundred benign-sounding “underlying research citations and other background information", which the authors encourage me to use. Thanks Mr. Levitt. Thanks Mr. Dubner. I needed an extra day to write this review because I spent most of one night watching lectures from Yale Professor Dan Kahan talking about the Cultural Cognition Project. Only one-hundred-ninety-nine more footnotes to go. This book won't be 2.5/5 stars for everyone. If, like myself, you enjoyed Steven and Stephen's earlier volumes, Freakonomics and Superfreakonomics , then congratulations! — you've found a subject area that interests you (albeit a sometimes nebulous one that can show up under the guise of a variety of disciplines). If, for some reason, you only feel comfortable learning about the ways in which data and patterns can reveal the inner workings of our world with these two Freakonomists, then t This book won't be 2.5/5 stars for everyone. If, like myself, you enjoyed Steven and Stephen's earlier volumes, Freakonomics and Superfreakonomics , then congratulations! — you've found a subject area that interests you (albeit a sometimes nebulous one that can show up under the guise of a variety of disciplines). If, for some reason, you only feel comfortable learning about the ways in which data and patterns can reveal the inner workings of our world with these two Freakonomists, then this book is for you. However, I'm an ever-curious being with little patience; and, thus, haven't been sitting around just waiting for the Steven/Stephens to give me the go ahead. I thought of giving a list of recommended reading here, but one of the cool things about Freakonomics is that its principles can be applied to almost anything — for me this has included books on the philosophical nature of humanity as well as ones that helped me figure out how to run a G-D factor analysis to draft my fantasy football team (spoiler alert: it wasn't that helpful for football purposes, but learning how to use R opened a whole new world of statistical computing fun for me). Easy and fun to read. It basically discusses how one should approach problems (big or small) and provides general steps that would help if we follow them through, like admitting when one doesn't know something, figuring out the real problem and its roots, thinking like a child, looking for and providing incentives to get certain things done, and so on. It also has some really interesting ideas that I would like to try myself some time. Freakonomics and the follow up book, SuperFreakonomics were two of those books that changed the way people looked at the world and the things that happened in it. In this third volume, Levitt and Dubner are aiming to teach you the way of thinking outside the box as they do. With chapters as diverse as The Three Hardest Words in the English Language, How to Think Like a Child and Like Giving Candy to a Baby, they bring more stories and anecdotes that demonstrate just how lateral thinking can bring Freakonomics and the follow up book, SuperFreakonomics were two of those books that changed the way people looked at the world and the things that happened in it. In this third volume, Levitt and Dubner are aiming to teach you the way of thinking outside the box as they do. With chapters as diverse as The Three Hardest Words in the English Language, How to Think Like a Child and Like Giving Candy to a Baby, they bring more stories and anecdotes that demonstrate just how lateral thinking can bring a fresh perspective on a problem, and that sometimes the uncomplicated answer is the correct one. I’m a big Freakonomics fan. I’ve read the two previous books, seen the movie, and I regularly listen to the podcasts. So for a fan like me, this book was slightly disappointing because I’d heard most of the material before on the podcasts. Still, since I love the lessons so much, I didn’t mind a review. I especially liked the lesson of embracing failure instead of fearing it. Temporarily putting away your moral compass before analyzing problems was a good one, too. As the authors say, you can’t I’m a big Freakonomics fan. I’ve read the two previous books, seen the movie, and I regularly listen to the podcasts. So for a fan like me, this book was slightly disappointing because I’d heard most of the material before on the podcasts. Still, since I love the lessons so much, I didn’t mind a review. I especially liked the lesson of embracing failure instead of fearing it. Temporarily putting away your moral compass before analyzing problems was a good one, too. As the authors say, you can’t solve a problem if you’ve already decided what to do about it. Thanks to Freakonomics, the subject of economics is more human to me, and I’ve gone on to read more books on the subject, most of them more academic in style. Because of that, the light-hearted style that appealed to me so much with the first books seems a little too light to me now. But ultimately, I love what these authors have to say, so I’ll read/listen to/watch anything they come out with, and I’m always looking forward to more. An entertaining read - or listen to be exact. Nothing stupendously ground-breaking to be honest but it's stuff that one doesn't really think about being too caught up in the rat race and what might be construed as conventional thinking. What I really like are the real world examples, while it might not be exactly relevant for my field of work in the financial sector, are more accessible and easy to connect to. The audiobook has added material which is a compilation of a few Freakonomic radio/pod An entertaining read - or listen to be exact. Nothing stupendously ground-breaking to be honest but it's stuff that one doesn't really think about being too caught up in the rat race and what might be construed as conventional thinking. What I really like are the real world examples, while it might not be exactly relevant for my field of work in the financial sector, are more accessible and easy to connect to. Levitt and Dubner continue to dazzle readers, freaks and soon-to-be-freaks with their fascinating way of combining data and narration to present interesting (and very much informative) stories on various fields. In this book, the "theoretical" ratio slightly increased than the previous two books as the intention is lay down the foundations of "how to think like a freak", basically how to rely more on "data" and less on "anecdote". It is still full of splendid stories. The book is full of a wealth of interesting stories with non-standard approaches to problem solving. Incredibly interesting stories. Книга сповнена величезною кількістю цікавих історій з нестандартними підходами до вирішення проблем. Неймовірно цікаві історії. I prefer the audiobooks over the physical books. They’re great for listening while doing other things. This is the third book in the Freakonomics series. You don’t need to read them in order. I’ve enjoyed all three. They talk about a variety of subjects. One subject was intriguing and not answered. A multinational retail company bought tv ads 3 times a year. They had their highest sales at those three times. The authors asked the question did the ads cause the sales? Or did the sales cause the ads I prefer the audiobooks over the physical books. They’re great for listening while doing other things. One subject was intriguing and not answered. A multinational retail company bought tv ads 3 times a year. They had their highest sales at those three times. The authors asked the question did the ads cause the sales? Or did the sales cause the ads? The company took out ads on the three biggest sale days: Black Friday, Christmas, and Father’s Day. The same company paid for advertising inserts in newspapers year round. The authors suggested the company run an experiment to see if those ads paid off - by doing no ads in selected areas for a few months and then comparing sales data. The marketing guys refused to experiment. They said they’d get fired if they stopped advertising. But they admitted that one summer an intern forgot to place the ads in the Pittsburgh area and there was no decrease in sales during that time. And still, the marketing guys refused to experiment. I’m having trouble with that. I don’t think I’d want to invest money in that company. The authors looked at religious communities in Germany - or somewhere near there. They found Protestants made more money than Catholics - even though they all started with the same wages per hour. The reasons were: Protestants worked more hours per week, Protestants were more likely to be self employed, and more Protestant women worked than Catholic women. Want to keep restrooms cleaner? Paint a fly in the urinal – male desire to target practice. At the end of the audiobook, there are several episodes from Freakonomics Radio. They are available as podcasts from iTunes and the Freakonomics web site. They were good. Co-author Stephen Dubner was excellent as a narrator. Good production equipment - I didn’t hear his breaths - yay. They made a website that asks people to flip a coin on whether or not to make a major decision then report how happy they were at a future date. Their conclusi Think like a Freak is a book that teaches people to think like kids. That means to not be afraid to not know an answer and investigate your interests without regard to what others may think. It also states to break large problems down and solve the small ones associated with them. The authors use various experiments to prove their points. They made a website that asks people to flip a coin on whether or not to make a major decision then report how happy they were at a future date. Their conclusions came to the fact that there is an upside to quitting something. They advise getting into other people’s minds and figure out what really matters to them to get them to do what you want. Watch what they do rather than what they say is how they offer to accomplish this. Also included in the book were other people’s stories where they thought like freaks and became very successful. This book is similar in format to their previous works - present a supposedly unconventional idea and support it with some entertaining storytelling. It's a very fast, mildly interesting read. Unfortunately, I had the feeling that I'd heard almost all of these stories elsewhere, so the book feels more like it's filling out a book contract than breaking great new ground in human thought. I listened to the audiobook and couldn't get excited. This was suggested for book club and I have not read any of their previous books. Nothing out of the ordinary here. A few stories got me laughing. Especially the one about people stealing more wood on a trail with a sign asking them NOT to, than the trail that had no sign at all. 2.5 stars rounded up kindly to 3. Bunch of really interesting stories. Just think outside of the box! Тепер при словосполученні "фантастична трилогія" я уявлятиму не Володаря Перснів. Сукупність математики, статистики, логіки, економіки і ще чорт зна чого у раціональних пропорціях у вигляді конструктивної методології можуть стати довершеним способом пізнання дійсності. Якщо ви "нормальна людина", то вам буде важко не піддатись численним спокусам нормальності, тому прочитайте цю книжку і думайте як фрік! 'Brilliant' is an adjective that I use quite loosely, but it is totally apt for this book. I've enjoyed the Freakonomics podcast, and some of the material in this book is similar, but it's still great to see it spelled in black and white. I just can't believe that I am reading this two years too late! Stephen and Steven emphasize that it is important to look beyond the obvious, when using data to make decisions. They don't really say that you should ignore data points and focus only on your gut. T 'Brilliant' is an adjective that I use quite loosely, but it is totally apt for this book. I've enjoyed the Freakonomics podcast, and some of the material in this book is similar, but it's still great to see it spelled in black and white. Stephen and Steven emphasize that it is important to look beyond the obvious, when using data to make decisions. They don't really say that you should ignore data points and focus only on your gut. The premise of the book is that we spend too little time in analyzing issues from different angles, and end up making wrong decisions too often. "The conventional wisdom is often wrong. And a blithe acceptance of it can lead to sloppy, wasteful, or even dangerous outcomes. Correlation does not equal causality. When two things travel together, it is tempting to assume that one causes the other. " I LOVE folks who can understand the difference between correlation and causality. I think it is absolutely fundamental to decision-making, but is ignored frequently enough. The authors talk about incentives, causality, ultracrepidarianism (quite a mouthful, eh?) and storytelling, among other things. Thinking like a freak has paid off for Steven Levitt and Stephen Dubner in their first two wildly popular nonfiction Freakonomics books. In this book, the authors continue in the same vein by presenting counter-intuitive ideas illustrated by interesting stories that help the reader to understand why those ideas actually do make sense. The authors go a little further this time by trying to help the reader make better decisions by thinking like a freak. My husband and I listened to parts of this tog Thinking like a freak has paid off for Steven Levitt and Stephen Dubner in their first two wildly popular nonfiction Freakonomics books. In this book, the authors continue in the same vein by presenting counter-intuitive ideas illustrated by interesting stories that help the reader to understand why those ideas actually do make sense. My husband and I listened to parts of this together on a car trip; we shared laughs and our ideas on what we heard. Later I finished listening on my MP3 player while working in the garden. Either way was very enjoyable and entertaining! I am not sure my brain is fully freaked out yet--I am looking forward to the next Freakonomics book! لم أتوقع أن أنهي الكتاب والحمدلله بهذه السرعة! لكن الكتاب (خفيف) بعدة معايير؛ معلوماته الجديدة القليلة مثلاً، أفكاره التي يمكن تلخيصها في صفحة واحدة أو اثنتين، أسلوب كاتبيه وهو أسلوب ولا شك بسيط وممتع. يختلف هذا الكتاب عن سابقيه بهذه (الخفة) غير المحمودة طبعاً، ويفتقر إلى وجود صورة متكاملة أو موضوع مطروح بعناية من كل زواياه.